Roseville Theater. Photo by David Lewinski. Chester Boot Shop. Photo by David Lewinski. MimiLa Rou. Photo by David Lewinski. Utica Road. Photo by David Lewinski. Gonzo!! Art Studio. Photo by David Lewinski. Just Delicious Tea and Scones. Photo by David Lewinski. "The area of Utica and Gratiot was known as the Utica Junction," says Roseville city manager Scott Adkins. "It grew up back in the late 1800s and early 1900s, primarily because it was a hub on the Detroit Interurban Railroad. At the time, Roseville was just a tiny village born out of Erin and Orange townships." But Utica Junction never became as established as downtowns in cities like Ferndale and Royal Oak, says Adkins, because of a focus on road-centered development that began in the 1950s. "Even though Utica Junction was the historic center of the community, geographically we developed along corridors as opposed to intersections," says Adkins. "At the time when the city was converting from village to city, Gratiot was a US highway, US Route 25, so it was a prime corridor. Then came Groesbeck. Then, in the '50s and '60s, came I-94, and in the '70s and '80s, I-696. That skewed our focus away from the town center and towards the corridors." Roseville City Manager Scott Adkins. Photo by David Lewinski. In the 1950s, Roseville's population exploded, growing from 15,816 in 1950 to 50,195 by 1960. Homes for middle-class families were built quickly, along with shopping centers and small manufacturing plants. Roseville was fully built-out by 1970, when it reached its peak population at 60,529. Like many of Detroit's inner-ring suburbs, the city experienced economic stagnation and declined over the past 40 years as development pushed deeper into the suburbs. Today, Roseville's population is holding steady at 47,380 with a median income of $40,300, according to the American Community Survey. The city recognized it needed a path for redevelopment about a decade ago. 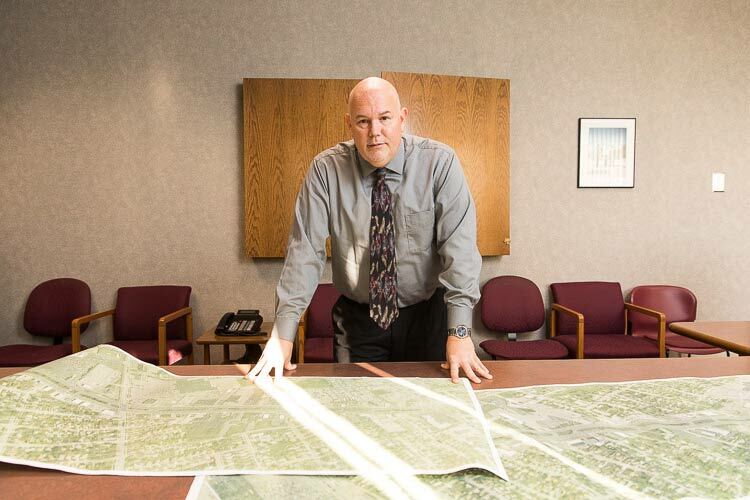 In 2014, Roseville became the first city in the state to be certified by the Michigan Economic Development Corporation under its Redevelopment Ready Communities program, which evaluates cities on a set of best practices for streamlining development processes. Melissa Roy, executive director of the nonprofit economic development agency Advancing Macomb, notes that Roseville has all of the basic amenities to compete as an affordable, accessible community in the region. "Roseville is a great place that everybody's kind of ignored for a long time," says Roy. "The housing stock is great and affordable, and the independent retailers give it a unique appeal. There's the Roseville Clock Shop and Corky's Surf Shop. Every kid in Macomb County, at least in my generation, got their first pair of Doc Martens at Chester Boot Shop. It's a great walkable community, but at the same time it has great access to some of the busiest transportation corridors in the region." As the city began thinking about its future, says Adkins, it recognized that re-creating a community center would be critical for it to move forward and be competitive. "We went back to our roots and looked at what we already had as a center of the community," he says. "Many of the buildings in the Utica Junction area had that traditional downtown sensibility with zero-lot-line placement and connected buildings. We have the Sacred Heart campus there. Our first City Hall was in that area. We focused our attention on going back to our foundations." So the city undertook an ongoing vision planning process for Utica Junction, with a focus on building a walkable downtown anchored by mixed-use developments, small businesses, on-street parking, bike lanes, pedestrian access and attractive landscaping. The process is being spearheaded by a one-year-old Downtown Development Authority. The DDA captures tax revenue from properties within the district and reinvests them in community amenities like facades, landscaping, and marketing. "We have this vision of being a downtown," says Jennifer Colombo, owner of Just Delicious Scones on Utica Road and chair of the new DDA. "It's hard to see it right now because there are not many buildings. There's not a lot of what you would think of as a walkable, intimate downtown with cafes and nice lighting. But Utica Junction has that potential." Adkins points to Colombo as the kind of entrepreneur that can realize that potential, particularly if the city is ready and willing to work as a partner. "Many times, traditional zoning may not allow for certain types of business uses. We're trying to work within a framework but also create an opportunity to bring in unique businesses," says Adkins. "Just Delicious Scones is a great example. They have a tea shop, but they also do manufacturing and market their product to be sold retail." 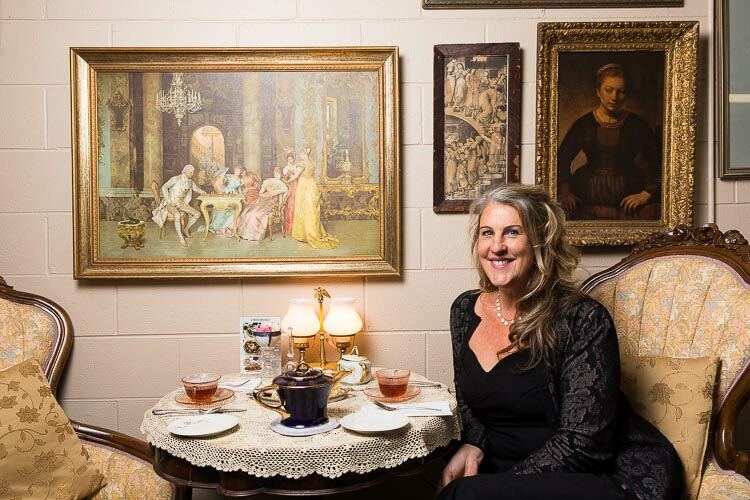 Jennifer Columbo, owner of Just Delicious Scones. Photo by David Lewinski. Colombo employs nine people at the facility and is looking to expand. The revenue from the wholesaling business supports the tea room, which also creates an amenity for the neighborhood. "It's unique and different than what you would find in most traditional downtown settings," says Adkins. "This type of thing often wouldn't be allowed. So we're trying to be flexible, to draw a different type of business mix to the downtown." Adkins and Colombo are excited about the opportunities. They are hoping for re-use of the historic Roseville Theater, perhaps as a micro-brewery or a micro-distillery. And in June, the city received a federal Transportation Enhancement Grant to build a bike path that will connect the city with neighboring St. Clair Shores. A potential linkage with Fraser is also being studied. If that's achieved, a bike path could connect the city with Lake St. Clair Metropark. While Colombo is excited, she knows the DDA has some work to do in getting the community and residents on board. "It's exciting because it's such a clean slate. There's a lot of great businesses that are hoping for change," says Colombo. "A lot of these businesses have been here so long, they have a hard time with believing change will come, and they want it to be real change." To that end, the DDA is planning a visioning session in January at Colombo's tea room. She hopes residents and owners of some of the area's established businesses will help lend their ideas. One of the people she'd like to hear from is Don Wolanchuk, a fourth-generation owner of Chester Boot Shop. 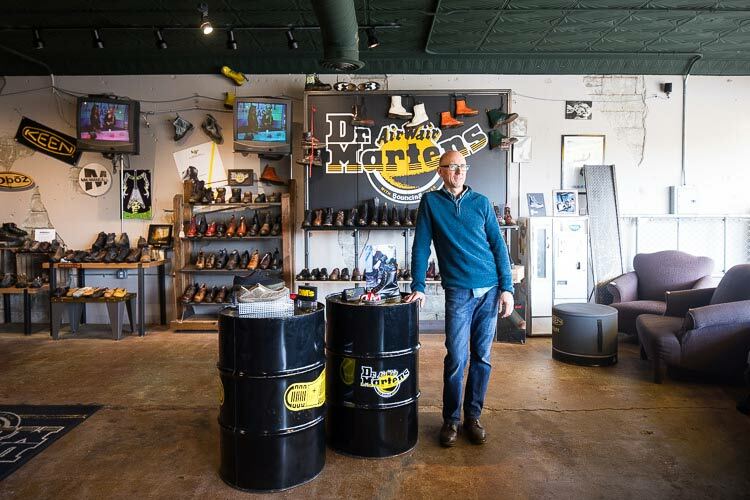 The shop has been at the location since 1948, selling high-quality work boots, cowboy boots, hiking boots, Doc Martens and more with an emphasis on customer service. (Hot tip: It's one of the few places you can still find Doc Martens made in the UK). Wolanchuk grew up in the store (he's happy to say he'll never have a foot problem because he's always worn good shoes). In all that time, he says, very little has changed in the area. Don Wolanchuk at Chester Boot Shop. "This is the oldest commercial strip on Gratiot outside of Detroit," he says. "I'd like to see things change, so long as it's done right." He'd love to see angled parking in front of the shop and more restaurants and destinations in the area, though he's not sure Utica Junction will ever be like Ferndale, where he frequently goes for a night on the town. And that's just fine, says Adkins. "We're always going to be Roseville," says Adkins. "We have an identity, and we're building on it."